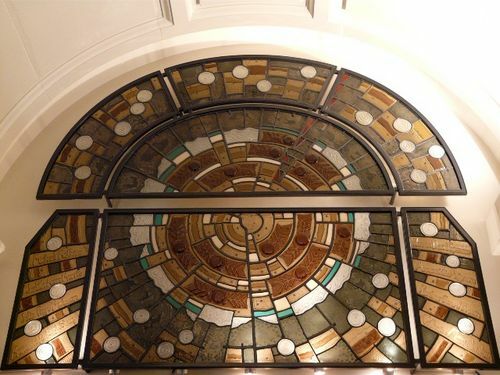 A stained glass window commemorates work colleagues who were killed by a crazed gunman. The Queen Street massacre was a spree killing that occurred on December 8, 1987 at the Australia Post offices at 191 Queen Street in Melbourne, Australia. The attack resulted in nine fatalities, including the perpetrator, and five injuries. Frank Vitkovic entered the building at 191 Queen Street, Melbourne, carrying a sawn-off M1 carbine in a brown paper bag. He began opening fire indiscriminately before he was overpowered by workers (one who was wounded) two of whom later received the Star of Courage bravery award while another two received commendations for bravery. While trying to escape he climbed onto a ledge and kicked free from one of the workers who was trying to prevent his escape and fell to his death. At the coronial enquiry, Forensic Psychologist Dr Allen Batholomew agreed that Vitkovic was criminally insane at the time of the shooting.